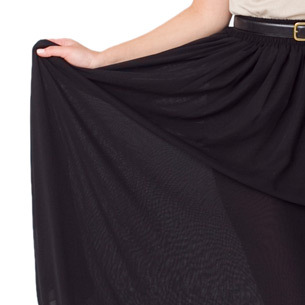 I came across this lovely chiffon maxi skirt in American Apparel which I thought I would share with you. It's £52 and comes in tan and black, I think it would be great to dress up or down for work or play.. It's a bit sheer so you'd need to wear something underneath, but I love it! If it wasn't for all the other things I've ordered since I've had all this spare time on my hands, I'd have certainly bought the tan one by now..
ive just found some maxi skirts on ebay and they are flowly not tight and match with the muslim dress code. also i have loads of maxi dresses they are my fave my blacks ones gone short :( but i have a feeling i could turn it into a maxi skirt any help?